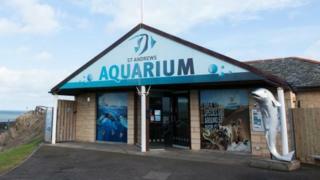 Staff at the St Andrews Aquarium were “gutted” after thieves made off with Big Mac, a giant statue of a mackerel. The 6ft (1.8m) model disappeared from outside the Fife attraction following graduation festivities in the university town on Friday, 29 June. Aquarium director John Mace said the statue was “quite heavy” and would have taken two or three people to lift. Police have been informed, but Mr Mace said there would be “no questions asked” if Big Mac was returned. The statue has stood outside the door of the aquarium for four years, but went missing overnight on 29 June. Mr Mace said Big Mac was “last seen heading in the direction of the town centre”. He added: “He’s quite heavy and it would probably have taken two or three people to lift him. Staff are gutted by his disappearance and we would love to have him back home.